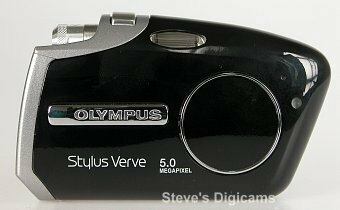 The Olympus Stylus Verve S packs 5 million pixels of image resolution into its compact, durable, all-weather designer body, along with new features such as a calendar, album function and a histogram for enhanced usability. 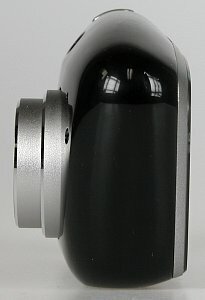 The Verve S is compact (only 3.7" x 2.2" x 1.1") and weighs ~4 ounces. Its ergonomic metal body provides all-weather protection from the elements, rubber gaskets throughout the camera�s interior insure that rain, sleet and snow won't stop you from taking clear and colorful images in any weather condition � get the camera wet, wipe it off, and keep on shooting. 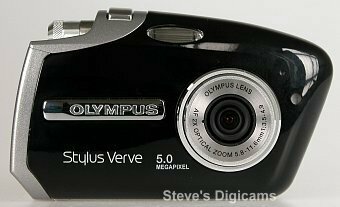 With a 2x optical zoom lens (35-70mm equivalent in 35mm photography) and 4x digital zoom, the Stylus Verve S delivers a seamless 8x total zoom to bring the action closer. The very best picture quality is always assured thanks to incorporation of the TruePic TURBO image processor, which delivers a broad color spectrum of light and dark colors with breathtaking clarity. Camera start-up and shot-to-shot time are also enhanced so no photo opportunity is missed. The Verve S employs a circular lens barrier that tucks away inside the camera body with a satisfying snap when the power is turned on, and protects it by creating a durable, impermeable seal from the elements when closed. The camera comes to life with your choice of one of three start-up sounds and a customizable image on the LCD. The Verve S also has three different shutter sounds to choose from. 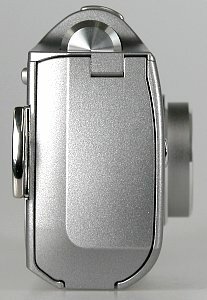 Atop the camera�s body is a unique rotating mode dial that spins to set the camera to take pictures, record movies or review images taken. The Verve S's HyperCrystal� LCD is a bright 1.8-inch display with 134,000 pixels of resolution that delivers a 160� angle of viewing so it can be seen clearly from above, the side, and from below. 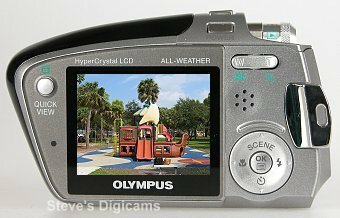 Where conventional LCD displays fail to deliver clear, visible pictures under bright conditions, the HyperCrystal LCD is viewable even in bright sunlight at the beach or on the slopes. The Verve S has 16 selectable Scene Program Modes that cover the gamut of possible shooting situations: Portrait, Self-Portrait, Landscape, Beach & Snow, Indoors, Cuisine, Night Scene, Fireworks, Panorama and more. Accessing these modes is as simple as a push of a new navigation control pad that allows users to quickly and easily cycle through the various settings displayed on the LCD screen menu. After an image is captured you can apply in-camera editing effects like Soft Focus, Fish Eye, Black and White, and Sepia. PictBridge support allows direct printing from the Verve S to any PictBridge-enabled printer, like the Olympus P-10 Digital Photo Printer, without using a computer. In addition, transferring images to the computer has never been easier with the Auto-Connect USB that does not require software drivers (for most computers/operating systems) for hassle-free and high-speed image downloads. The Verve S also comes with a rechargeable Li-Ion battery and charger. 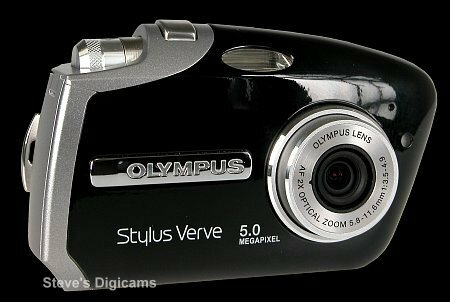 The Stylus Verve S will change the way you think about your digital camera. Now instead of simply capturing images, you can think of your camera as a portable photo album that goes wherever you go. The new Album Function makes it easy to organize photos into photo albums stored on the camera�s xD-Picture Card�. You can create up to 12 individual albums of 100 images each, in the order you want to show them, and take your photos everywhere � your photo album will no longer be confined to your coffee table. And with the new built-in Calendar Function, images are automatically organized and recalled by date. 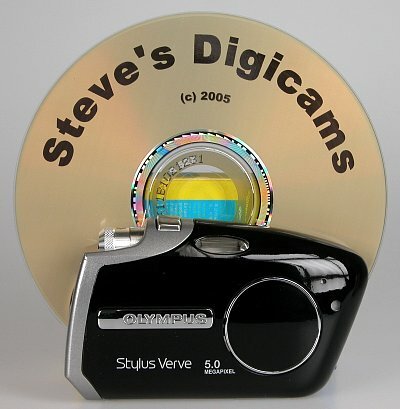 The Stylus Verve S compared in size to a standard CD.